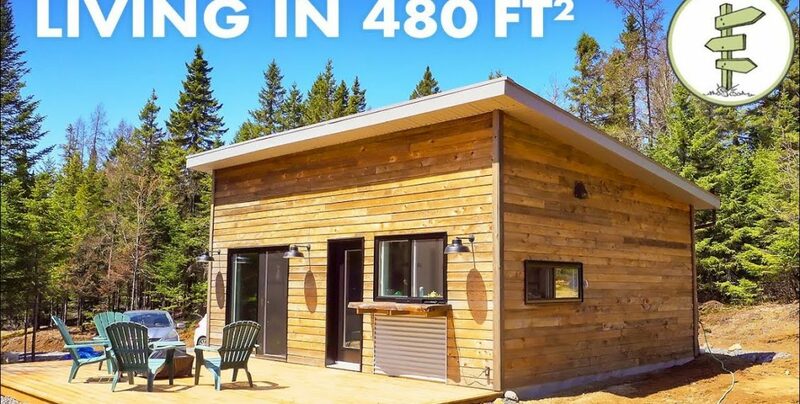 Take a tour of this 480 square foot tiny house and watch the interview with Maxime, who built and lives in the house with his girlfriend. We asked Maxime why he chose to build a house this size, how he found a legal place to put it, and what it’s like now that he’s lived in the house for over a year. We love that Maxime’s house has low energy needs because it’s a small home with a passive solar design, extra insulation, triple glazed windows, and in-floor radiant heating. He has a well for fresh water, a septic system for waste water, and he’s hooked up to a municipal power grid. He says that with his design and low energy needs, it wasn’t necessary to invest in solar, although that’s not always the case with every home.